1. Please note that the DIY repair will void the warranty of your devices but may save money. 2. Unlike the product images, this Samsung Galaxy S6 screen assembly is branded with Samsung logo on the top. 1. This Samsung Galaxy S6 screen assembly includes the Outer Glass + LCD Display Screen + Touch Digitizer + Samsung Logo. 2. You'll get a free repair toolkit in the parcel to help you in the repairing process. 3. OEM LCD in new condition unless sold as used or refurbished, each screen of is tested before shipping and 100% working. Color: Available in Gold, White, and Black. Choose the correct color above. 1, Please test the functionality of this product before installation. 2, The flex cables are very sensitive and are easily damaged. Please handle carefully. 3, Please try to handle the repair work in a dry and dust free environment without direct sunlight. 4, The installation should be done by a qualified person. Seller is not responsible for any damage caused during installation. Veritas Cellular® is the ONLY seller authorized to use this listing. Any purchase from others will not be subject to warranty. We have been selling on Amazon for over 4 years, with thousands of orders and 99% positive feedback. We are family owned and USA based. Original OEM LCD replacement with Gorilla Glass 4 outer glass, Super AMOLED touchscreen, 2560 x 1440 pixels resolution. 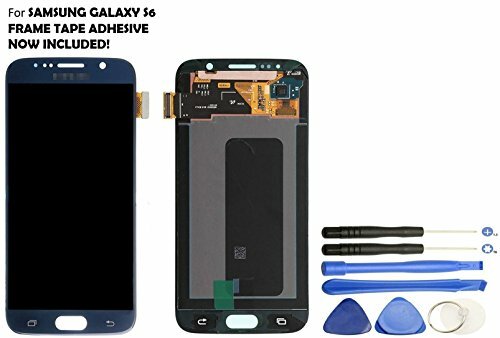 Compatible with SM-G920A (AT&T), SM-G920P (Sprint), SM-G920T (T-Mobile), SM-G920V (Verizon), SM-G920R4 (US Cellular), SM-G920F (Europe), SM-G920 (Global) etc. 30 Day Money Back Guarantee. 90 Day Warranty for defect caused by non-human factors. Fulfilled by Amazon. This Samsung Galaxy S6 screen assembly includes the Outer Glass + LCD Display Screen + Touch Digitizer + Samsung Logo. If you have any questions about this product by Veritas Cellular, contact us by completing and submitting the form below. If you are looking for a specif part number, please include it with your message.